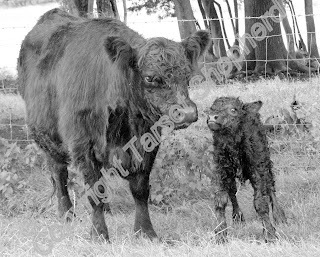 Nowt to do with sheep at all, just thought I'd share with you this Galloway Cow and calf. 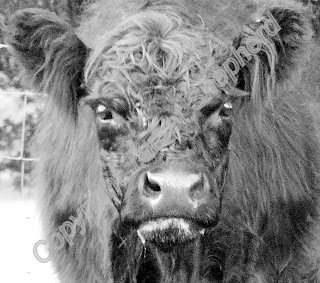 Galloways are traditional hardy hill cattle, hairy characters they are - well suited to living outdoors all year round. you might notice the camera is getting a mean look off this particular beast, I hesitate to add that the zoom is quite powerful and I was on the other side of the fence as she had just calved and I had no intention of going anywhere near her - I'm too young to die!! She was actually quite well behaved all things considered but I would never tempt fate. I've always had a soft spot for the Galloway, my first two shepherding jobs included a herd of Galloways and I found them slowly creeping into my heart. 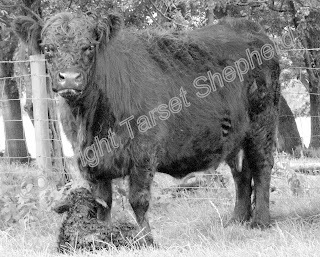 Independent type cattle able to withstand most that is thrown at them, noted for being wild but I have found since that many of these continental cross cattle are equally wild if not more so.